The 43.3 metre superyacht Aquasition, listed for sale by Bob Cury at RJC Yacht Sales, has had a further price reduction of $1,000,000. Delivered by Trinity Yachts in 2010 and most recently refitted in 2018, Aquasition was built to be ABS-classed and MCA compliant. She boasts an aluminium hull and superstructure with teak decking and can sleep up to 10 guests in four king-sized cabins and one twin cabin with a crew of nine. Her $1.5 million refit early in 2017 included a full repaint. Her interior was redone in 2018 by Architectural Interiors with new furnishings, carpeting, fabrics, marble, new lighting, updated audio/video systems, new LED television screens and fresh soft goods throughout. Her interiors in cherry wood joinery feature a traditionally-styled main saloon complete with a dining table for up to 10 and a cosy lounge area. An additional lounge in this yacht for sale boasts further sofas and armchairs with a corner cocktail bar. On deck, there is a spacious al fresco dining area aft with additional built in seating, while forward of the bridge is a lounge area with sofas and two small tables. Her expansive sundeck offers guests the perfect spot to relax in the sun on a lounger or in the Jacuzzi with a cocktail from the nearby bar. Twin Caterpillar C-32A 1,800hp diesel engines allow for a maximum speed of 17.5 knots and a cruising speed of 13 knots. For added safety and comfort, she is fitted with Quantum zero speed stabilisers. 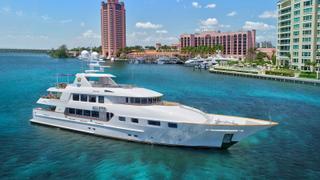 Lying in Boca Raton, Florida, Aquasition is now asking $15,900,000.